In recent weeks, we’ve seen some gutsy stuff from a number of Aussie sportspeople. Surfer Sally Fitzgibbons burst an eardrum in the second round of the Fiji Pro. No problem. She bandaged up her head, ignored doctors’ orders and went out and won the title. Basketballer Matthew Dellavedova played himself into the ground for the Cleveland Cavaliers in the NBA Finals, requiring hospital treatment for cramping and dehydration. “He’s made of steel or something,” said his teammate LeBron James. Yep, the LeBron James. And Jason Day somehow put himself into US Open contention despite playing a large chunk of the tournament with vertigo, an effort his caddie described as ‘superhuman’. Then there’s Shane Watson. He did stuff all. Admittedly, he didn’t lose the first Ashes Test on his own. That was a genuine team effort. And by the time he arrived at the crease in the second innings, with Australia’s run chase in tatters, Don Bradman himself would have had a hard time saving the day. But there was an opportunity tailor made for Watto in the first innings, when Australia was 4-207 and still more than 200 runs shy of England’s opening dig. The scene was set for Shane to fashion a knock for the ages, salvage some Aussie pride, rescue his career and address the long-standing public perception that he’s an absolute dead loss. As chances at redemption go, Clint Eastwood couldn’t have scripted it better. And our anti-hero got through the opening scene OK. He saw us through to the end of the second day, with 29 runs to his credit. It was a foundation on which to build. A new day dawned, full of promise. But we’ve been here before. We know how this story goes. One more run and Watto was done, out lbw, his default dismissal. He accepted his fate in his usual way, by calling for a review from the third umpire, who responded in his usual fashion by telling him to take a hike. “He’s about as good with technology as my mum is,” tweeted one onlooker. Watto has now been dismissed 29 times in Test cricket putting his best foot forward, so to speak. He waves his leg in front of the bowler like Angelina Jolie at the Oscars. He is so prolific at this style of dismissal the Twitterati has renamed it Leg Before Watson. And now Shane Watson’s Test career may finally be at an end. Aussie coach Boof Lehmann has already said it’s going to be a ‘tight call’ between Watto and Mitchell Marsh for a spot in the second Test. But we’ve been here before too and looked on open-mouthed as Watto has lived to see yet another innings. Another brief innings. And that’s the thing. For all his faults, and there are many, Watto is a unifying force. While public debate rages on matters social and political, we come together virtually as one on the topic of Watto. Right from the first ball he bowled in Test cricket, he has entertained us with his ineptitude. He transcends cricket. 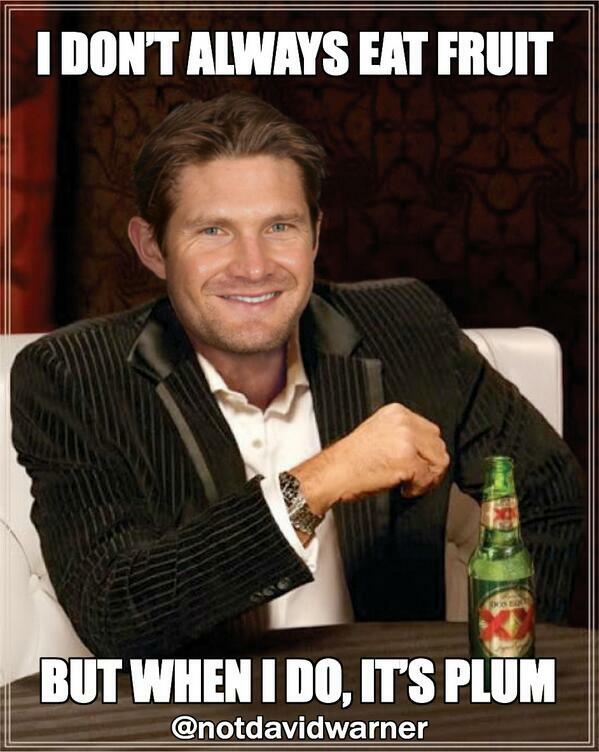 With no Ashes cricket played in Cardiff yesterday, Shane Watson jibes made their way into the wider sports vernacular. Over at the Tour de France, the Astana cycling team was likened to Shane Watson for its current ability to stuff everything up. And then the Watto commentary broke out of sport altogether. Even the Poms got in on the act. Worries for the future of the BBC, as Shane Watson calls for a review of it. This will all be lost to us if Shane Watson gets dropped. We risk this global fraternity we have so studiously built. Sure, there will be others to ridicule. But Watto’s a special case. And we may never see his like again. DennisCricket_ kaz_blah people hurt people dying got me questioning where is the love! Wessex73 DennisCricket_ I have to admit it’s like taking candy from a kid. kaz_blah Wessex73 To be fair to Kaz, he’s just ‘reporting’ on what social media is doing. kaz_blah DennisCricket_ who do you support without the parody who? Wessex73 DennisCricket_ Without the parody, I’d be in tears about what happened at Cardiff. Seriously, about to burn another set of bails.